Zebra mussel is near! The breaking news that zebra mussel is now in Prior Lake reminds us that our concerns are validated - Lake Minnetonka is a big target. We must now step up our efforts and be vigilant. Efforts have been and will continue to be increased to protect Lake Minnetonka. Specifically, the Lake Minnetonka Association and the Lake Minnetonka Conservation District are joining forces to increase the inspector hours at public launches. The MN Department of Natural Resources will be increasing enforcement efforts at Lake Minnetonka as well as Prior Lake and Mille Lacs Lake. All three agencies will continue and expand their public awareness programs to make sure we are all taking actions to keep zebra mussels form getting into the lake. First of all, to the best of anyone’s knowledge, zebra mussels are not now in Lake Minnetonka. Secondly, I believe we can, with a comprehensive, coordinated effort, keep zebra mussels out. Here are what lakeshore owners and lake users can do. • spray or rinse boats with high pressure and/or hot water, or let them dry thoroughly for five days before transporting to another water. 2. Zebra mussels may be introduced if attached to used docks and boat lifts. Lakeshore owners who have purchased a used dock or boat lift and suspect it has come from an infested lake, please make sure it is free of zebra mussels before putting it into Lake Minnetonka. 3. Lakeshore owners should routinely check their shoreline for suspicious-looking shells. Call me if you have any questions or would like to know what to do if you find anything suspicious. The threat of zebra mussels is imminent and serious. If zebra mussels get into Lake Minnetonka, the results will be disastrous. Impacts will include property devaluation, boat damage and increased maintenance costs, beach closures, and expanded milfoil infestations. 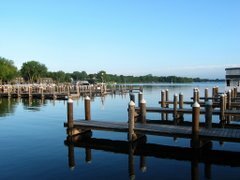 We can – we must – marshal our efforts and investments to protect Lake Minnetonka. Our investments now will also help protect Lake Minnetonka from other exotic plants, animals and viruses, which while not as imminent, are also coming this way. Each new aquatic invasive species that gets into the lake will magnify the impacts.